Skill India holds conference to ensure convergence and coordination in skilling, re-skilling and upskilling! 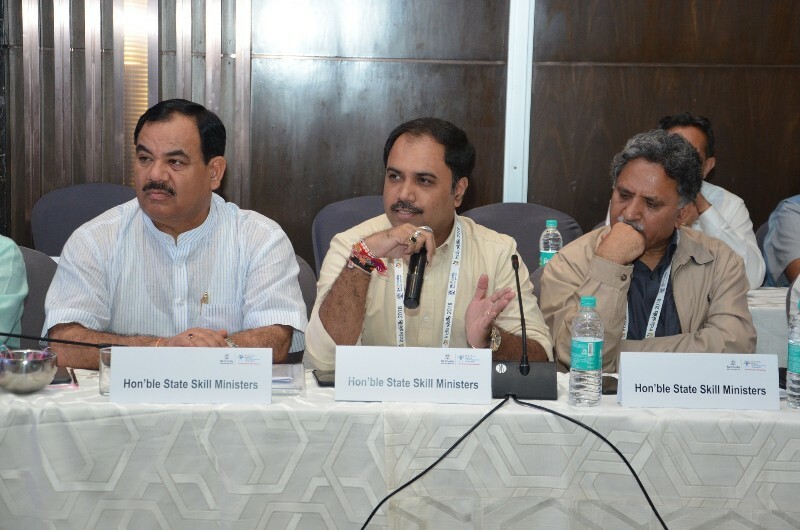 A National Conference of State Ministers on Skill Development and Entrepreneurship was conducted in New Delhi and was presided over by Anantkumar Hegde, Minister of State, Ministry of Skill Development and Entrepreneurship. The meeting was held on the sidelines of the ongoing IndiaSkills 2018 National Competition where more than 400 candidates are competing in 50 skills representing 27 States/UTs in the country. The meeting saw participation from representatives across all 29 states. Some of the key dignitaries who were present at the event were Sambhaji Patil Nilangekar, Minister for Skill Development and Entrepreneurship, Labour, Earthquake Rehabilitation, Ex-Servicemen Welfare, Maharashtra; Thokchom Radheshyam Singh, Minister for Skill Development, Manipur; Chetan Chauhan, Minister, Sports and Youth Welfare, Uttar Pradesh; Harak Singh Rawat, Minister for Skill Development, Uttarakhand; and Khurshid Ghanai, Advisor to J&K Governor. The half-day long meeting witnessed a lively discussion between the Central and the State Governments on the critical need for scaling up concerted efforts to enhance skill development in India, in the context of the country’s transition to a knowledge-based economy through the creation of a professional skilled workforce. Governmental efforts, especially in the recent past, in the arena of skill development through various schemes and programme, management structures and processes, enhanced infrastructure, and local challenges encountered within these initiatives were discussed at this session held with the States. The States also requested further up-gradation of ITIs and said they would continue laying emphasis on promoting apprenticeship and creating opportunities for employment with the support of local industries. Also present were Dr. KP Krishnan, Secretary, MSDE; Rajesh Agrawal, Joint Secretary, MSDE; Rajesh Aggarwal, DG, Directorate General of Training (DGT) and Manish Kumar, MD & CEO, National Skill Development Corporation (NSDC). #Breaking: AAP took funds from Khalistanis during their Punjab campaign?